DRIVEWAY GATES, ORNAMENTAL METAL WORK, BLACKSMITH RAILINGS, CUSTOM DECORATIVE DESIGN RAILS, CURVED RAILS FOR INTERIOR OR EXTERIOR. WE ARE A FOURTH GENERATION BUSINESS MAKING ORNAMENTAL IRON PRODUCTSSINCE 1932. WORKED FOR SEVERAL COMPANIES BEFORE STARTING HIS OWN SHOP. AND RESIDENTIAL WORK. IRON WORK IS OUR HERITAGE. NOW MY SON MARK IS GOING TO CONTINUE THE BUSINESS AND MAYBE MY GRANDSON SOMEDAY. TODAY WE PRIMARILY MAKE RAILINGS, GATES AND FENCE FOR NEW AND EXISTING HOMES WITHIN 30 MILES OF PITTSBURGH. 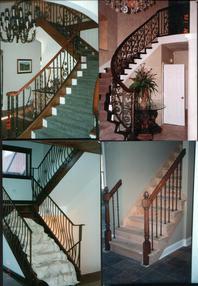 ALL OF OUR WORK IS CUSTOM MADE TO FIT THE REQUIREMENTS OF YOUR HOME. THE PICTURES BELOW CAN BE ENLARGED BY CLICKING ON THE IMAGE. 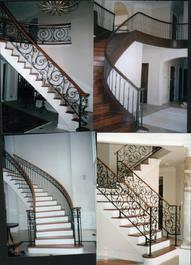 These rails are custom fabricated or forged designs. For more pictures see our interior rails page. These rails are made from cast or stock parts and can look just as good as custom pieces. Cast Iron panels can give an Old World look to your new railing. They can also come in rust free aluminum. Driveway Gates provide security, privacy and a dramatic first impression. Our welded Aluminum railings look and feel like a steel rail.With a powder coated finish will not require maintenance for many years. Balcony and flower boxes can add beauty and color to a plain building. Simple handrails give security when using the stairs. Traditional twisted and straight picket rails to match existing rails on porches. Gates to keep chilldren, dogs or strangers in or out. Fences to secure your property, protect children and pets. Finishes- we offer custom and faux colors to match your lighting fixtures or trim colors. The pavillion at Phipps Conservatory -Childrens Garden was done by our craftsmen.